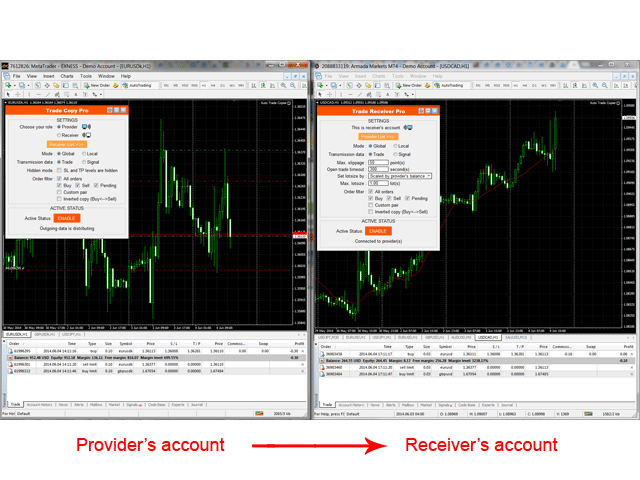 Trade Receiver Free is a free tool to copy trades/signals from multiple MT4/MT5 accounts. Provider must give you a free license in his list first. That means you can use this free tool to copy trades/signals from a provider, who accept to give you a free license. This tool has all receiving features of Trade Copier Pro. Receiver can manage provider list with powered build-in database managing system. 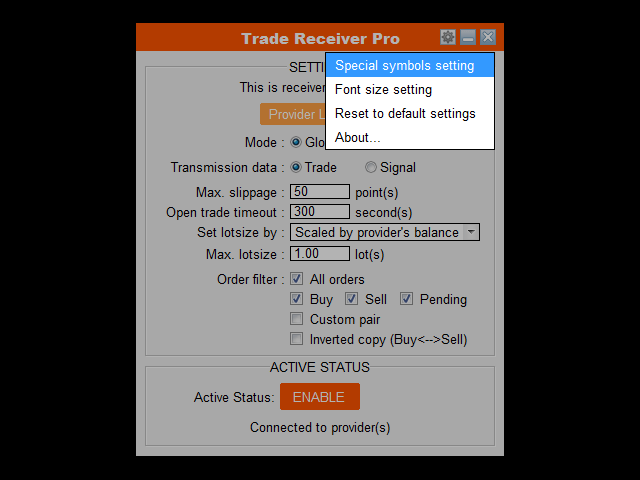 Note: Trade Receiver Free only receives trades/signals from Trade Copier Pro full version. It does not work with Trade Copier Pro Demo. 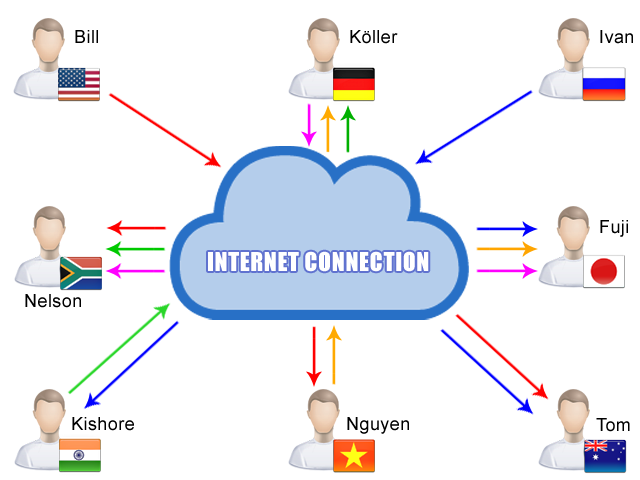 Allows to receive trade/signal from multiple providers. Manage provider list via powered database managing system without additional tool (add, remove, edit, enable/disable). Monitor provider's status (online/offline, add/remove your account). Switchable between Global mode (copy over internet) and Local mode (copy within the same PC/Server). Switchable between Trade protocol (copy trades) and Signal protocol (send/receive signal alert only), but provider's choice is priority. Protect receiver from slippage, outdated orders and over lotsize. Allow trade manually or use other EAs without any conflict. Allows up to 5 special symbols setup (i.e. : GOLD --> XAUUSD, etc.,) to synchronize with provider. Multiple lot size setting options. Auto send mobile notification and email when account has new activities. 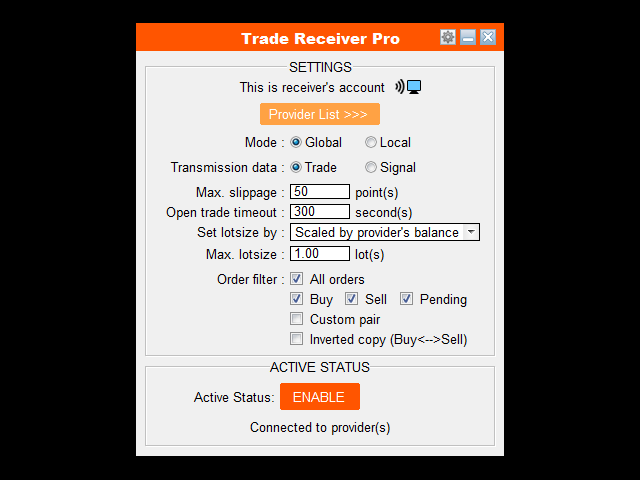 Install Trade Receiver Free to any chart. Contact to your provider and ask him to give you a free license to copy from him. 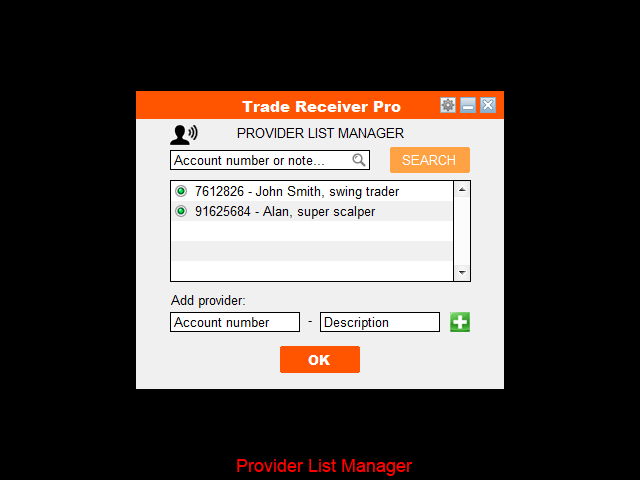 Then, go to "Provider List" and add provider's account number that you want to copy trade from. Please make sure that your provider has been connected and added your account number to his/her list already. Similar to Trade Copier Pro, but except that it does not have provider's features (check Trade Copier Pro for details). Now I can copy signal from my provider for free. Great system!!! - Fixed: Adapt if provider use old version. - Fixed: Cannot find a provider in Local mode. - Added: User can edit the provider list by .csv file outside of MT4. - Improved: Auto calculate lotsize scale if provider's account currency is different from receiver's account currency. - Improved: Can connect to all other versions of my copier. - Added: Allow receive local copy. - Added: Scale factor for "Provider risk scaling" lotsize option, allow receiver to scale the risk of provider. - Fixed: Save provider's special symbol after restarting the EA. - Improved: Add more detailed message to warn the user if connect to copier full version. - Improved: Notify user about copy server URL if it has not been added. - Fixed: Conflict if maximum allowed order amounts between provider and receiver are different. - Improved: Better error report. - Improved: Better recognition position close with different deviations and filling types. - Fixed: Minor bug in printing provider list. - Fixed: Minor bug about adding a new provider. - Fixed: Removed untradeable symbols in Market Watch with some brokers (like Exness). - Improved: A receiver is able to set different options for each providers group by loading the copier on different charts. - Improved: Adapt to order comments from the new version of copiers. - All existing copied orders need to be closed before updating this version. - Trade Receiver and Copier must be of the same version. - Improved: Slightly faster data transfer. - Added: Notification if Internet connection is lost. - Fixed occasional duplicated position opening (sometimes, MT5 platform is late in recognizing a new position). - Improved: More attempts to open/close positions if requoted in MT5. - Fixed: Server address correction. - Added: Alert when logging in with an investor account as a receiver. - Added: Copy filter options for a receiver. - Added: Backup servers input. - Changes: Switched server to copy.autofxpro.com. 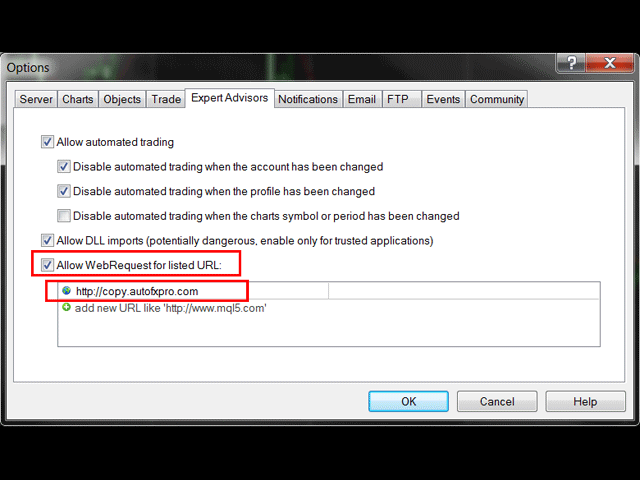 - Fixed: Better order/position management for MetaTrader 5. - Added: Balance ratio option for lotsize. - Improved: Faster copying speed. - Fixed: Incorrect lotsize add-up in some cases. - Improved: More stable for data transferring. Note: Please make sure that there is no copied order processing before upgrade. Increased the number of decimal points in lotsize multiply factor. - Improved: More compatible with various MT5's order filling policy. - Fixed: Minor bugs about symbol recognition (reported from users).